« For Whom Were the Gospels Written? Mark’s parables were generally about nature but he introduced people into his parable of the vineyard. God’s ambassadors met with persecutors. Matthew added people to some of Mark’s nature parables (e.g. the seed growing secretly became the parable of the wheat and the tares and included dialogue between a farmer and his labourers) and introduced new parables all with human agents. The people in Matthew’s parables are all collective stock figures, classes of people who were either good or bad by nature. The most tolerance he would show towards the wicked was a willingness to let them be until their day of judgment fell. Luke takes the personal element to its next level. The people in Luke’s parables are individuals, not collectives. They are not cast in black or white but are able to change, repent, mix good actions with wrong motives. This more realistic psychological awareness is true of Luke’s characters generally and not just those in parables. Zacchaeus has a change of heart; the prodigal son does a turnabout in relation to his father; the unjust judge does not want to put himself out but in the end does the right thing out of self-interest; among other cases. Jesus’ parables in Luke are not without allegory but the distinctly Lukan parables can well be understood without reference to allegory. The people themselves act out the message in a way for anybody to understand. The parables are not supernaturally revealed wisdom. There is no need for a key to unlock mysteriously coded meanings. Allegory is not totally absent, however. Samaritans, we come to realize, are symbolic of “the other”. 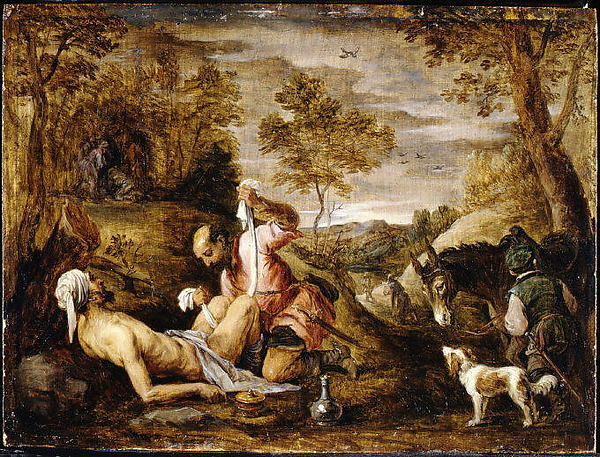 The good Samaritan contrasted with the religious elites, the Samaritan leper among the nine other lepers, are precursors to the episode in Acts where the church expands beyond Jerusalem to evangelize Samaria. Suggestive symbolism enriches the prodigal son parable: the father represents God, the elder son represents mainstream Judaism, association with pigs brings gentiles to mind. At the same time, however, the key message of the parables can be understood without knowledge of their allegorical tapestry. Notice. . . . . The friend at night (Luke 11:5-8) Drury sees the rousing of the neighbour as the crisis. One might assign the neighbour turning away from his friend’s need as the crisis but the story but the narrative world consists of a guest turning up unexpectedly and the urgent need to feed him, followed by coming at midnight to a friend with a request, and eventually the friend’s relenting to the request. Note also the rich dialogue and change of heart among the characters. The unjust steward (Luke 16:1-12) we see the turning point of the parable is the resourceful facing of the crisis mid-narrative. Again, the focus on individuals and dialogue to convey the message. The prodigal son (Luke 15:11-32) — The mid turning point; psychologically developed individuals; optional allegory. And he called one of the servants, and asked what these things meant. . . . . The rich man and Lazarus (Luke 16:19-31) — Drury sees the rich man being careless of the crisis before him in Lazarus. Matthew adapted Mark’s version of the exchange. Matthew omits phrases from Mark’s account and exchanges Mark’s “scribe” with a “lawyer”. Luke built upon Matthew’s version although he did not forget Mark entirely. See the diagram below for the details. Luke characteristically added more interesting dialogue and interaction between Jesus and the lawyer. Luke further built on Matthew’s legalistic interpretation (“These are the greatest commandments and that’s that! What more is there to say?”) by taking the opportunity to stress the importance of kindliness and humanity (as he had done earlier in the Sermon on the Plain). Hence Luke introduces another parable about people, the Good Samaritan. But why did Luke choose to have a Samaritan along with Jewish “clergy” as his foils? The answer very likely is to be found when we step back and take in Luke’s larger themes. For Luke the Jerusalem Temple is a central motif from the birth of Jesus to the final chapters of Acts. Luke’s story at one level is about the failure of the Temple and its eventual replacement by another service, one represented in the parable by the Samaritan. Recall from above the way Luke’s Samaritans take on the meaning of “the other”, those outside the Jewish nation. The parable is a microcosm of the larger theme of the failure of Judaism and its replacement by Christianity. But what of the narrative details of the Good Samaritan story? 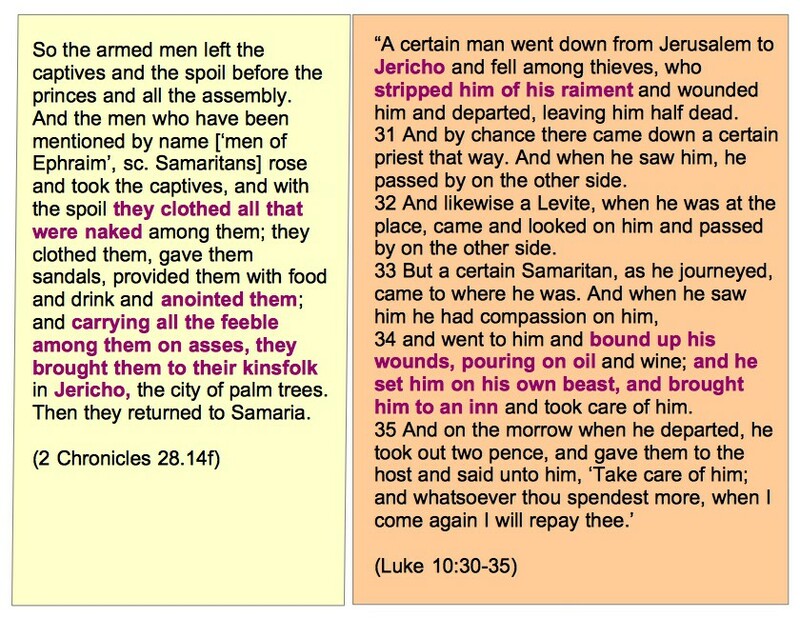 The Good Samaritan parable is essentially an illustrative story. As explained above this form of parable is typical from Luke. Such stories are familiar from the Old Testament. God punished Ahaz, the king of Judah, because he burned incense under trees and on hills and for other wicked deeds. The punishment consisted of Syrian and Israelite armies waging war and slaughtering and capturing many tens of thousands of Ahaz’s troops. The king of Israel, Pekah, and his leading military officer, Zichri, led 200,000 captive women and children back to the gates of Samaria, the capital of the kingdom of Israel. Before they entered the city, however, a prophet named Oded came out and castigated the Israelite king for his brutal treatment of his related tribe. So brutally had he treated Judah that God himself was now angry with him and his kingdom of Israel. Other leading men emerged from Samaria to add their voices to Oded and to demand that the captives be treated kindly. I think this all adds up to a good case for the Good Samaritan along with other famous parables unique to Luke were the author’s own compositions. It is not likely that Luke was attempting to incorporate a popular orally transmitted tale supposedly from Jesus. Posted on 2014-10-16 12:01:04 GMT+0000 by Neil Godfrey. 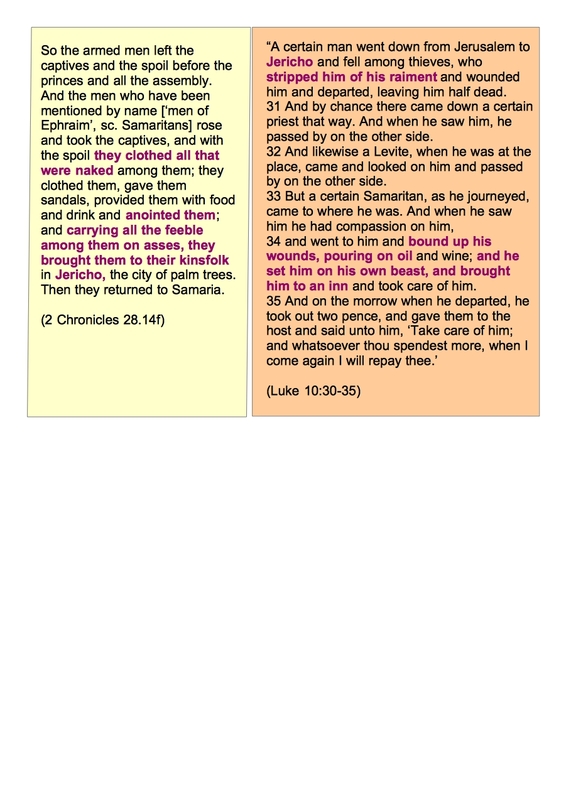 This entry was posted in Biblical Studies and tagged Drury: Parable in the Gospels, Good Samaritan, Gospel of Luke, John Drury, Luke-Acts, Parables of Jesus. Bookmark the permalink. Good point! I’m not into Q myself and I can’t find much about it on Vridar because it isn’t a category and you can’t search for “Q” very effectively. And I don’t see a series on Mark Goodacre’s “The Case Against Q”. Am I missing anything? OK, just figured out to search “The case against Q”. I see several posts there. FWIW, I really dislike reading the King James Version. In small doses, it’s fine, but lots of it makes me annoyed. I’ve not written much on Q partly because it’s far too complex a topic and there are already some excellent websites covering the arguments as I’m sure you know. To do justice to the arguments both for and against would require me to do far more intensive study and reading than I have allowed myself time for. I’m obviously biased in favour of the arguments for literary relationships and intertextuality but at the same time I understand that presenting only one side of an argument (such as in this post) is really side-stepping the question of Q and not by any means refuting Q as an alternative. 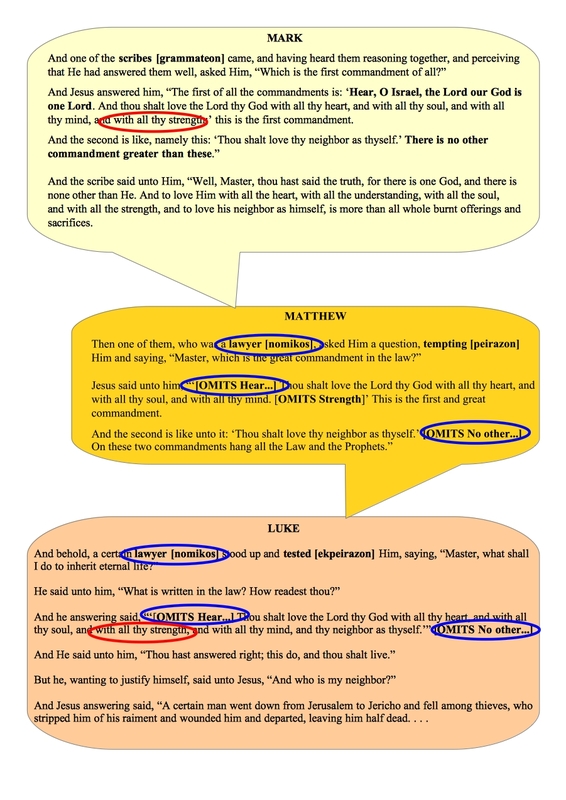 Whenever in any studies of Luke and/or Matthew the perspectives on the textual relationships to Mark and Q are missing, my interest in them is much diminished. I don’t think you can get a clear view on the motives of the original authors of these gospel stories without discussing in detail what they did to these two sources as well. Drury does not allow any room for addressing Q in the way I think you mean. He believes Luke used Matthew and Mark. No Q. The Samaritans get slandered pretty badly in the Bible and in Rabbinical writings but there is evidence that the so called First Temple was in Samaria’s Mount Gerizim and not Jerusalem. The “lost tribes” of the Bible were the Samaritans. Actually, if you were to consider all the extra-biblical evidence we have, the earliest known temple would have been that in Elephantine, as the high priest there claimed it existed long prior to the Persian conquest of Egypt. In terms of the archaeological record, we don’t have any evidence of Solomon’s Temple (recall the “Second Temple” was built on exactly the same site to exactly the same specifications) or of the Elephantine temple that was destroyed by the Egyptians, and the evidence we have of the Samaritan temple places the initial building to early in the so-called Persian Period (and perhaps slightly before the time of “return” from exile) with a significant expansion occurring around the time of Antiochus III the Great. Moreover, according to Israel Finkelstein, the archaeological record seems to help identify anachronisms in the story of the building of the Second Temple that place the story to the time of Herod (or maybe slightly earlier in the late Hasmonean period). My theory is that the Judaism of the Old Testament, and especially the Primary History, was essentially unknown prior to the Seleucid conquest of the region, that the fictional Solomon was an intentional reference to Ptolemy II, who was associated with the founding of the syncretic Yawheh cult, and that the destruction of the fictional Solomon’s Temple was an intentional echoing of Adam and Eve being cast out of Eden for disobeying Yahweh. What was Solomon’s “Original Sin”? He failed to build his temple where the original version of Deuteronomy appears to have mandated: Mount Gerizim. The whole point of the Primary History was to legitimize the Samaritan Temple as the proper central seat of cultic power in the region and to delegitimize the Ptolemies. Some, including Thomas L. Thompson, would argue that the Samaritans only had the Torah, not the full Primary History, but that argument fails if you accept, as Thomas L. Thompson does, Calum Carmichael’s argument that Deuteronomy was written in part based on the stories of Israel’s first kings, which are found in Samuel and Kings (books that the Samaritans don’t have today). The obvious retort is that the Samaritans must have copied the Torah from the Jews in Jerusalem, but there is far more evidence to indicate that the folks in Jerusalem were the plagiarists. For example, the stories of David and Solomon are polemics against the Ptolemies, and the laws the Ptolemies (and David and Solomon) violated were honored by the Seleucids. A better explanation for the Samaritan’s lack of a Primary History outside of the Torah is that the latter books formed the seeds of the Samaritan Temple’s destruction by the Ptolemaic loyalists who became known as the Hasmoneans in that the latter books unintentionally allowed the Ptolemies to argue that Jerusalem was the proper seat of cultic power. The authors of the Primary History were far too subtle on the point that Yahweh’s covenants with David and Solomon were null and void because of David’s and Solomon’s violations of those covenants. As Thompson has argued, the kingdom of Judah was a reference to Ptolemaic Egypt, and based on that, my theory is that the authors, in arguing that the House of David (the House of Ptolemy) remained legitimate rulers of Judah (Egypt), merely intended to indicate that the Ptolemies remained rightful rulers of Egypt (and perhaps the offered a promise the Seleucids would not seek to overthrow Ptolemaic rule of Egypt). As you can probably tell, I believe the Primary History originated as Seleucid propaganda, most likely in the time of Antiochus III, designed to legitimize the shift of cultic power in the region from Ptolemaic loyalists (in Judah) to Seleucid loyalists (in Samaria). The combination of the archaeological record and the extra-biblical written record (including Josephus) supports this interpretation of the nature and purpose of the Primary History, and that’s because my theory starts from such evidence instead of from the Primary History itself.